Anna DeWolfe, amongst many other awards and accolades, was recently awarded the prestigious Portland Press Herald Player of the Year award for the second year in a row. Anna led her Greely HS team to 2 consecutive back to back state titles. Anna leaves Maine school girl basketball on the highest note as one of the premier players in the history of girls basketball leaving her mark and setting the bar high. Anna will continue her basketball journey at Fordham University next season and no doubt make a mark at the next level. 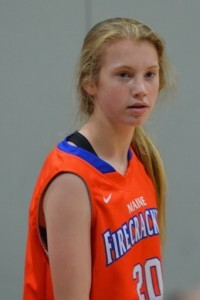 The PPH POY award is not foreign to the Maine Firecrackers. In addition to Anna for 2018 and 2019, the award also went to former Firecrackers – Allie Clement 2013 and 2014, Ashley Storey 2015 and Emily Esposito in 2017.